Working with inventors, business leaders and other attorneys as an extension of their teams to protect, enforce and capitalize on their intellectual property. From patent and trademark searches and applications to infringement litigation, our team is with you every step of the way during your intellectual property journey. Whether our clients are national or international, we provide a level of service they would expect from a local firm. We are attorneys who are engineers and scientists proficient at understanding our clients’ inventions and discoveries. We’ve successfully litigated hundreds of cases so, whether you are the Plaintiff or the Defendant, you can trust us to get the best possible results in the courtroom. Our clients and the firm’s attorneys work together as a team to protect and manage their intellectual property. Working with investors, business leaders and other attorneys as an extension of their teams to protect, enforce and capitalize on their intellectual property. We are attorneys who are engineers and scientists proficient at understanding our clients' inventions and discoveries. Our clients and the firm's attorneys work together as a team to protect and manage their intellectual property. 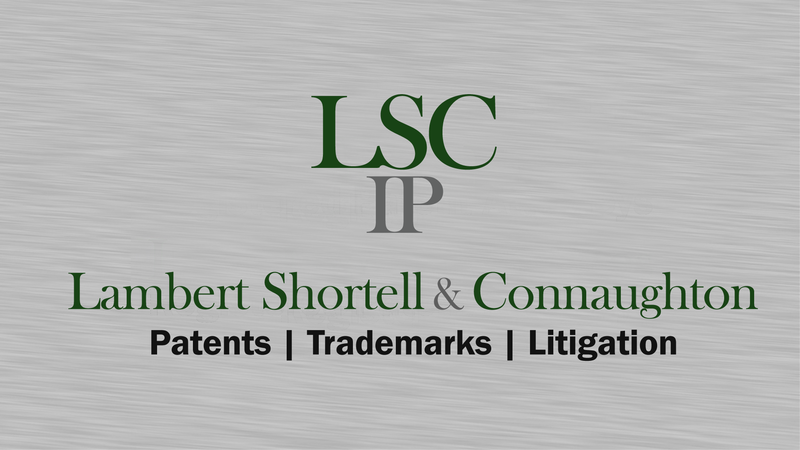 Lambert Shortell & Connaughton is exclusively devoted to assisting our clients with Intellectual Property Law. Our Registered Patent attorneys are certified by the U.S. Patent and Trademark Office. Consequently, we have attained a very high level of proficiency in our specialty of protecting, enforcing and capitalizing on the intellectual property of our clients. Are you an individual inventor with a new or improved idea, invention, product, or method, or do you have a new name, slogan, or design you wish to protect? Are you a business that has a new product or method that will allow you to better compete in the marketplace, or do you use a trademark or service mark? Are you an attorney seeking patent counsel with a winning record in the courts and with the Patent Office? It was great meeting with Gary. I entered his office with some interesting ideas along with a plan and Gary helped me put my vision into an even clearer view. Thank you! Beyond my expectations, very friendly and helpful. Looking forward to working with Lambert & Associates in the future. Very nice to meet with David. No stress. Information given is clear and to the point. I definitely recommend Lambert and Associates to anyone looking for Legal help. They also have attorneys with chemical and mechanical background so technical write up would not be an issue for them to translate. Attorney Gary Lambert gave CrossBox International, in depth insight into our Trademark Registration and offered great litigation strategies to maintain ongoing registration with the “USPTO”. Really appreciated Gary’s information and guidance. Went for a consult, Gary was very professional and helpful. Liked that it is a smaller law firm feel that I can get more personal service. I went to the office in Boston yesterday for a consultation. Everybody who works at the firm was extremely welcoming and friendly. During the consultation all my questions were answered and I learned a lot of things that I did not now. What I especially liked about the consultation, I was not rushed out, he made sure that all my questions were assured before I left. I enjoyed meeting Gary. The initial consultation was informative. They did a patent search & analysis for my invention. The analysis was comprehensive. They searched for any & all existing patents that would be remotely similar to my idea, then, compared them to mine and gave me their opinion as to how, or if I should move forward. I am contemplating my next move, but will only use Lambert & Assoc. if I decide to move forward. Comfortable atmosphere. Informative and no pressuring approach. Awesome experience. We are looking forward to a long business partnership with Gary and his team. Our appointment was informational, provided the direction we were looking for and very rewarding. We were impressed with how soon we could get an appointment and the professional yet “comfortable” environment. Met with Gary about some trademarks armed only with my knowledge from the USPTO site, which I confirmed isn’t enough. He was very helpful and easy to understand as he highlighted the key points. I hadn’t been to the web site and found the pages there also very useful. We are currently moving forward and working on a trademark worksheet. I’d highly recommend the consult and the firm. U.S. Pat. No. 9,,670,537 B2 to Titan Collaborative Kithe, LLC of Roxbury, VT discloses Lyme infection testing. .
United States Registration No. 5,224,937 was issued to the Regco Corporation for Pita Brittle. U.S. Pat. No. 9,669,324 B2 to Creative Toys, LLC of Hollis, NH discloses a cost effective, structural building set, suitable as a toy. U.S. Pat. No. 9,648,882 B2 to Almerick Holdings Ltd. discloses an apparatus for liquid dough goods preparation . Lambert & Associates announces name change to Lambert Shortell & Connaughton. I am impressed with the team. The initial consultation was quite informative and Brendan answered all my trademark registration questions. Making appointment online is really a great option. I will certainly use Lambert & Assoc. when I move forward.